Being a young, modern woman, I am of course appalled on a daily basis on how women are portrayed and the techniques advertising uses to try to convince us they have a "female friendly" product that I can relate to. However, what irks me even more than women enjoying low-fat yogurt in a bikini is when products try to disguise themselves as forward thinking and blasting stereotypes, while at the same time, perpetuating them. "What you won’t find on Shine: Advice on how to please your man and diets that urge you to “lose 10 pound fast!” What you will find on Shine: Why buying an expensive “It Bag” is a waste of money; how to make a meal in 30 minutes and how to make a face mask out of last night’s 30-minute meal (okay not really, but you get the idea); how to de-stress at your desk; sharp, opinionated takes on the news; and finally, that you aren’t alone in your “Dancing with the Stars” obsession." Hmm... is it just me, or does what you won't find sound not too different from what you will find? Upon visiting the homepage for Shine, I scrolled down and was greeted with a picture of a woman chowing down on a large chocolate bar, followed by an article titled "25 big-picture tasks to keep in mind at spring cleaning time." Somehow, that doesn't seem much more sophisticated then the topics they promise to avoid. For a long time, us in the PR and Marketing field have gotten a bad rep for being spin artists. We prefer to see it as presenting a strong argument for our team - we're not lying, we're just stating it as we believe it to be true. This does not account for the fact that we (or our employer) may in fact be slightly delusional, but let's set that aside for the moment. When you work in the business of pitching, you develop a healthy dose of skepticism, along with a strong radar for detecting when you, yourself, are being pitched. You also get pretty good at predicting "the sell" when you know you're headed in to the lion's den. And such was the case as I ventured over to West Midtown to look at a new apartment complex. West Midtown is generally considered to be an "up and coming," "transitional" neighborhood. I use quotes here because these are exactly the words I expected to hear come from the leasing agent's mouth as we discussed the property, and more importantly, the price. It happens to everyone in the real estate market, buying or renting. And these agents are very good at their jobs. I can attest, because 24 hours later I'm still thinking about putting a deposit down on that apartment - car jack-ings and all. After all, who wouldn't want to get in on the ground floor of somewhere so "up and coming." Sigh. They've beat me at my own game. I like to read, and not always about marketing. But from time to time I'll try to recommend some of the industry-related reading I've picked up. 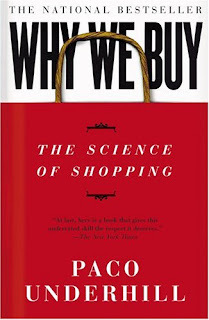 Why We Buy was a really insightful read - and interesting enough to keep me paging through it on my vacation in Los Angeles - something that should have been far more compelling than reading something about marketing. I couldn't wait to see what Underhill would say next. Now, when I shop, I notice a lot of the subtleties talked about in this book, from the width of the aisles to the placement of shopping baskets. Retailers have really taken notice of Underhill's reasearch. And for good reason. I strongly believe that this book should be required for marketing students and veterans alike. Marketing is a societal process which discerns consumers' wants, focusing on a procduct or service to fulfill those wants, attempting to move the consumers toward the products or services offered. Marketing is fundamental to any businesses growth. The marketing teams (marketers) are tasked to create consumer awareness of the products or services through marketing techniques. Unless it pays due attention to its products and services and consumers' demographics and desires, a business will not usually prosper over time. Or so says the all-knowing Wikipedia. Ever since I got over my dream of wanting to be an actress or a ballerina or one of many other childhood ideals, I wanted to work in marketing. Why? Because I was fascinated by the science and technique behind creating desires, selling a dream, telling people what they want. Well, here I am, forging a career in the marketing world, and even after it's been demystified by years of college, mindless internships and a lot of writers block, I'm still amazed at the techniques I see being used every day. This blog is a collection of my marketing musings as well as an opportunity to give props to others who are doing a bang-up job planting the seed of desire in all of us.